No purchase necessary. Void where prohibited. Enter at Facebook.com/SunsetMarina starting on April 12, 2019, 10AM CST, through May 20, 2019, 10AM CST. Must be at least 18 years old and a legal resident of the United States at time of entry to enter. One winner randomly selected to win above mentioned prizes. ARV: $4,000. No employees of SMR or sponsor may enter or win. Additional restrictions apply. Rules at SunsetMarina.com. This Sweepstakes is in no way sponsored, endorsed, or administered by by Luke Bryan or Row Crop, LLC. NO PURCHASE NECESSARY TO ENTER OR WIN, NOR WILL A PURCHASE IMPROVE ONE’S CHANCES OF WINNING. Odds of winning will depend on the number of eligible entries received. Void where prohibited. By entering, each entrant acknowledges that the Sweepstakes is in no way sponsored, endorsed or administered by Luke Bryan, Row Crop, LLC or Facebook. 1. Eligibility: Entrants must be legal US residents, at least 18 years old or above. Entrants must have a valid Facebook account as of April 1, 2019. Void where prohibited. Employees of Sunset Marina & Resort (the “Sponsor”), and their respective affiliates, parents and subsidiaries, the Sweepstakes’ participating sponsors and their advertising agencies, members of the immediate families of such persons are not eligible to participate and win. The term “immediate family” includes spouses, siblings, parents, children, grandparents and grandchildren, and any other person residing at the same household whether or not related. Winning a prize is contingent upon fulfilling all requirements set forth herein. 2. Sweepstakes Period: The Sweepstakes begins on Friday, April 12, 2019 at 10:00 AM CDT and ends on Monday, May 20, 2019 at 10:00 AM CDT (the “Entry Period”). Sponsor reserves the right to shorten or extend the Sweepstakes Period due to events beyond its control or for reasons set forth herein. 3. Sweepstakes Entry: To enter the Sweepstakes, participants go to https://www.facebook.com/SunsetMarina/. If participants do not have a Facebook account, they may visit www.facebook.com to create one (it is free). Once participant clicks “Like” on Sunset Marina & Resort’s Facebook page, they must search the Newsfeed for the “Luke Bryan” post. Click “Like” under that post, and you will be officially entered to win. Participants may enter only one time for the entire Sweepstakes Period. Entrants acknowledge that (i) the Sweepstakes is in no way sponsored, endorsed or administered by or associated with Luke Bryan, Row Crop, LLC or Facebook and (ii) information provided is being disclosed to Sponsor and not to Luke Bryan, Row Crop, LLC or Facebook. On Monday, May 20, 2019 one (1) winner will be randomly selected from all eligible entries by a member of Sponsor’s staff after close of the Entry Period (that is, after 10:00 AM CDT). All entries become the property of Sunset Marina & Resort and will not be returned. Incomplete entries will be disqualified. Multiple entries by means of software-generated or other automated processes will be disregarded and voided in Sponsor’s sole discretion. In the event of a dispute as to any registration, the authorized account holder of the Facebook account used to register will be deemed to be the registrant. Sponsor reserves the right to use any and all information related to the Sweepstakes, including information on entrants obtained through the Sweepstakes, for marketing purposes or any other purpose, unless prohibited by law. Sponsor reserves the right to contact entrants and all other individuals whose email address is submitted as part of this promotion. Only one prize per person, household, or email address allowed. 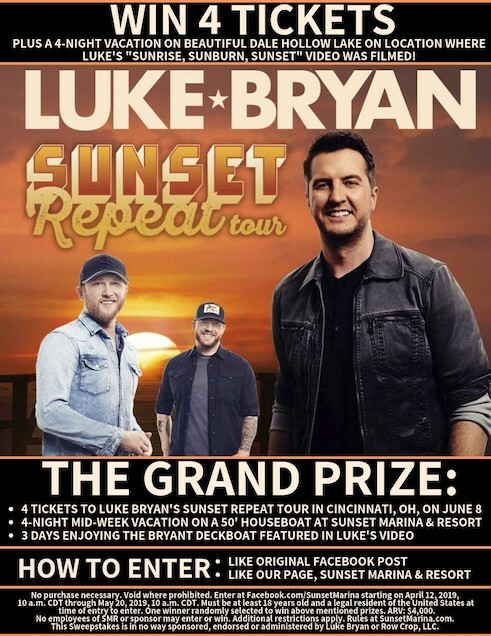 Prize: One (1) winner will receive four (4) tickets to Luke Bryan’s “Sunset Repeat Tour” at Riverbend Music Center in Cincinnati, OH on June 8, 2019, at 8:00pm CDT, 4-night mid-week vacation on a 50’ Houseboat, and 3 days enjoying the Bryant Deckboat at Sunset Marina & Resort. Retail value: $4,000.00. For purposes of clarification, each entrant acknowledges that the Prize does not include transportation, travel, meals or accommodation costs, and that the Prize does not include fuel for the 50’ Houseboat, all of which shall be the winner’s sole responsibility. Winner Notifications: The Sweepstakes winner will be notified via a message on Facebook after 10:00 AM CDT on Friday, May 20, 2019, following the selection of the winner. The winner must respond to such Facebook message within 24 hours from the time that the notification is sent or Sponsor reserves the right to award the prize to another entrant. If Sweepstakes winner does not respond within 24 hours, that winner will forfeit the prize and another entrant will be selected as winner. 6. Prize Acceptance/Restrictions: Only one (1) winner. The winner is subject to verification by Sunset Marina & Resort of the winner’s name, age, address, and phone number. In order to claim his or her prize, winner must appear in person at Sunset Marina & Resort, 2040 Sunset Dock Road, Monroe, TN 38570. The winner will be required to sign an Affidavit of Eligibility/Release of Liability and Publicity. Failure to do so will disqualify the winner. No entries from individuals under the age of 18 will be accepted. If a winner is disqualified, Sponsor reserves the right to determine an alternate winner. Prizes cannot be redeemed for cash or substituted for any other items by any winner. Prizes are non-assignable and non-transferrable. Sponsor reserves the right to substitute a comparable prize of like or greater value, including cash, for any prize, for any reason. All costs and expenses except as explicitly set forth herein are the sole responsibility of the winner. 8. Disclaimer: Sponsor is not responsible for mechanical, technical, computer, hardware or software errors, malfunctions, or failures of any kind, including failed, incomplete, garbled, or delayed transmission of entries, traffic congestion, viruses, sabotage, satellite failures, electrical outages on telephone lines, on the Internet, at any website or application or lost or unavailable network connections or natural disasters or acts of God or man, which may limit an entrant’s ability to participate in the Sweepstakes, and any injury or damage to entrant’s or any other person’s computer related to or resulting from participating in or downloading any information necessary to participate in the Sweepstakes. Sponsor reserves the right to cancel the Sweepstakes if it becomes technically corrupted. 9. Taxes: Any valuation of the prize(s) stated above is based on available information provided to Sunset Marina & Resort, and the value of any prize awarded to a winner may be reported for tax purposes as required by law. All taxes, including federal, state, and local taxes, are the sole responsibility of the winner. 10. Conditions: Sponsor reserves the right, in its sole discretion, to disqualify any individual implicated in any of the following actions, if for any reason: (a) infection by computer virus, bugs, interruption in wireless calling devices or wireless service, tampering, unauthorized intervention, actions by entrants, fraud, technical failures, or any other causes which, in Sponsor’s sole opinion, corrupt or affect the administration, security, fairness, integrity or proper conduct of the Sweepstakes, (b) the Sweepstakes or any website associated therewith (or any portion thereof) becomes corrupted or does not allow the proper processing of entries per these Rules, (c) the Sweepstakes becomes corrupted due to wireless calling service interruption for any reason, or (d) the Sweepstakes is otherwise not capable of running as planned. By entering, entrants represent that they are eligible and agree to be bound by and comply with the Rules and the decisions of any judges. Any entrant who attempts to tamper with this Sweepstakes in any way or use fraudulent means to participate in and/or win the Sweepstakes shall be disqualified. Sponsor reserves the right to disqualify any entrant at any time, for any reason, including, without limitation, language, activities or behavior deemed inappropriate. Sponsor and their advertising and promotion agencies are not responsible for cancellations, postponements, or delays. Other than the prizes received by the winner, no entrant shall be entitled to receive any wages, benefits, fees or other compensation whatsoever as a result of participating in the Sweepstakes. Sponsor shall have the sole discretion to administer the Sweepstakes and interpret and apply the Official Rules. Official Rules and decisions of Sponsor, which shall be final in all respects; (b) to release, discharge, and hold harmless Sunset Marina & Resort, Luke Bryan, Row Crop, LLC, Facebook, and their respective affiliates, parents, subsidiaries, advertising and promotion agencies, officers, directors, employees, representatives, and agents (the “Released Parties”) from all liability, injuries, losses or damages of any kind to persons, including but not limited to death, invasion of property ( under appropriation, intrusion, public disclosure of private facts, false light in the public eye or other legal theory), defamation, slander, libel, violation of right of publicity, infringement of trademark, copyright, or other intellectual property rights, or property damage resulting in whole or in part, directly or indirectly, from the acceptance, possession, misuse or use of a prize, (including any travel or activity related thereto), or from participation in and/or entry into or creation of an entry for the Sweepstakes and/or the broadcast or exploitation or use of entry or any other Sweepstakes-related activity; and (c) that the Released Parties have neither made nor are in any manner responsible or liable for any warranty, representation or guaranty, expressed or implied, in fact or in law, relating to any prize. In consideration for his or her participation in the Sweepstakes, each entrant agrees to hold harmless and indemnify the Released Parties from any and all claims, demands and/or causes of action of any nature or kind whatsoever, whether presently known or unknown, foreseen or unforeseen, that arise out of the entrant’s participation in the Sweepstakes, including attorneys’ fees. 12. Limitation of Liability: The Released Parties are not responsible or liable for (i) any incorrect or inaccurate entry information or other errors in the printing, offering or administration of the Sweepstakes or in the announcement of the prize(s), (ii) any error, omission, interruption, defect or delay in operation or transmission at any website, or wireless calling service, interrupted or unavailable network, server or other conditions, (iii) failure of any entry to be received by Sponsor due to technical problems, telephone service problems, human error, or wireless calling service, (iv) communication line, hardware and/or software failures, malfunction of phones (including wireless phones/handsets), phone lines, other communications malfunctions, unavailable network connections, cellular equipment towers, telephone systems or wireless service, (v) damage to any computer (software or hardware) resulting from participation in the Sweepstakes, or damage to mobile phone or other PDA device, (vi) theft or destruction of, tampering with, unauthorized access to, or alteration of entries and/or entry information, or (vii) entries which are late, lost, stolen, damaged, illegible, and/or unintelligible (or any combination thereof) or (viii) any change of email address, mailing address, telephone number and/or any other contact information provided by entrant. Any expenses incurred by the entrant during the application process, including but not limited to, postage are the sole responsibility of each entrant and the Sponsor will not issue reimbursement for any expenses. 13. Choice of Law/Forum: Tennessee law shall govern this Sweepstakes, without regard Tennessee’s choice of law rules. The courts of Tennessee shall be the exclusive forum for any dispute regarding any Rule or activity associated with the Sweepstakes. 14. Official Rules: To request a copy of the Rules, send a self-addressed stamped envelope to Luke Bryan Sunset Repeat Tour Sweepstakes, Sunset Marina & Resort, P.O. Box 580, Byrdstown, TN 38549, by May 15, 2019. Written copies of these Rules are also available during normal business hours at Sunset Marina & Resort. 15. Names of Winners: For the name of the winner, send a separate, self-addressed, stamped envelope to Luke Bryan Sunset Repeat Tour Sweepstakes, Sunset Marina & Resort, P.O. 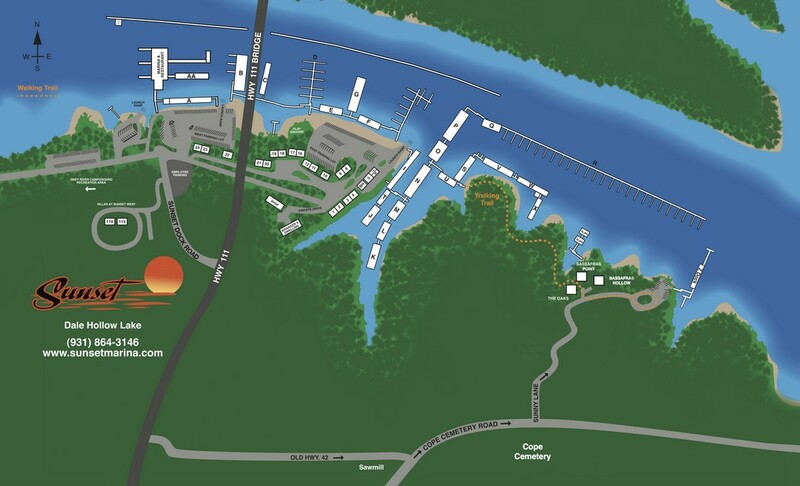 Box 580, Byrdstown, TN 38549, or appear in person at Sunset Marina & Resort between normal business hours after May 20, 2019.